DAGGETT, Mich.---Devin Olsen tossed a three-hitter, stiking out 11 batters, to lead the Escanaba Eskymos to a 12-2 victory over the Stephenson Eagles Wednesday night in the central Menominee County town of Daggett. Olsen threw 97 pitches over 6 1/3 innings before Andrew Sedlar got the final two outs to finish off the first-year Eagles. Offensively, the Eskymos took advantage of nine walks and six Stephenson errors that led to eight of Escanaba's 12 runs being unearned runs. 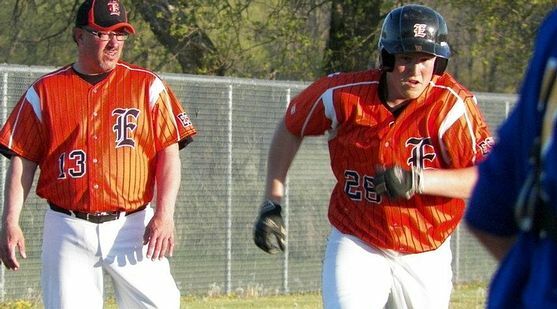 "Some kids took advantage of their chance to play, so it was a good game for us," Eskymo Manager Kirk Schwalbach said. "Those kids work had in practice." Eagle Cory Mikus waits for the throw. Schwalbach chose to start nine players who normally don't start, giving them some playing time ahead of a tough stretch of games that might have the younger guys get limited opportunities. In last week's game with Stephenson, the mostly freshmen and sophomore line-up trailed 4-3 in the fourth inning, prompting Schwalbach to bring his regulars into the game. Not so this time, and it was mostly because of Olsen. Stephenson's Ricky Chaney got a single and scored on a hit by Matt Hanson to give the Eagles a 1-0 lead after one inning. After the Eskymos tied the game in the second inning, Trevor Christophersen got a lead-off triple to start the bottom of the inning. But Olsen settled down, getting the next three men on two strikeouts and a groundout. That started a dominating string of at-bats for Olsen, as he retired 14 straight Eagles batters until he gave up a pair of walks in the sixth inning. But by the time that happened, the Eskymos had firm control of the outcome of this game. "It took him a while to settle in, but when he did, he had good command," Schwalbach said. "I mean, his curveball, it was just nasty. It was breaking down on the left-handers' feet. He struggled with his control in his last outing. This was a confidence-builder." Devin Olsen was in control on the mound. "I felt my curveball after the second inning, and it just worked for me," Olsen said. "I could get the corner a lot. It was kind of nice. I just strarted breathing. I wasn't breathing that much in the first inning when I was pitching, so I started taking deeper breaths. It was really warm (80 degrees at game time)." Escanaba took a 2-1 lead in the third inning when Ian DeMarse walked and scored all the way from first on a double by Olsen. Olsen got caught between second and third base and was tagged out, but the Eskymos still had the lead. Then in the fourth inning, Escanaba broke the game open with four runs....two of them scored on an error, while DeMarse doubled home a run and Lewis Ostrander got his first RBI hit as an Eskymo. Lewis Ostrander's first Eskymo base hit! DeMarse ended up with two solid base hits, two walks, and a run batted in. "Ian hits well when he waits and hits the ball up the middle," Schwalbach said. "When he uses the whole field, and doesn't get out on that front foot, he's a good hitter. He comes to practice every day and he works hard. I was proud of him today." Freshman Tyler Skufca's two-run double in the fifth inning made it 8-1. Eagles' Matt Hanson was hurt by errors. "Tyler has been getting the bat on the ball," Schwalbach said. "He's been getting some opportunities, and he's taking advantage of them. He always seems to make contact. He doesn't strike out very often. He's a good little hitter." Olsen went into the seventh inning, and walked the leadoff batter before getting the first out. That's when Schwalbach pulled him, and Sedlar got the final two runs, although an error scored Stephenson's second run. That was Escanaba's only error of the game. Sedlar celebrated his 17th birthday by getting two hits and an RBI, along with the brief scoreless appearance on the mound. Andrew Sedlar's birthday base hit, an RBI too! "It feels good," Sedlar said. "They were throwing me mostly fastballs. I think we're starting to get together and work more as a team, and I think we're coming through." Matt Hanson pitched the first 4 1/3 innings for Stephenson (4-9). He allowed eight runs on six hits, but only two of the runs against him were earned. Christophersen pitched the final 2 2/3 innings. He was tagged for four runs on five hits. Only two of the runs against him were earned, as the young Eagles players missed several easy plays. Escanaba (10-5) is on the road again on Friday. The Eskymos will face the DePere (Wis.) Redbirds in DePere. The game starts at 5:30 ET. The broadcast on WCHT-AM (600) will start at 5:15, and it will also be streamed live on www.rrnsports.com. Click the thumbnails in the "ARTICLE HIGHLIGHTS" box to see even more phontos for both the Eskymos and Eagles, taken by Sheila Olsen. Travis Heller is safe at first base on a throwing error.